Meeting govt officials looking for investors in Jiangsu Province requires a strong stomach. I hadn’t done the government banquet routine for a couple of years, so I was a little out of practice last month when some colleagues and I traveled to Yancheng, in northern Jiangsu Province, to investigate local government developments in the wind power industry. For two days, local government officials of various districts in the predominantly agrarian region inveighed us with rich food, beer, wine and a glorified moonshine called baijiu that most middle-aged Chinese men like to drink. The three of us—two Americans and one British—are all ‘South Jiangsu’ men. That makes a difference in China, where the country's Mason-Dixon line separating northern culture from southern culture is effectively drawn along the Yangtze River, which stretches from Shanghai in the east to the Himalayas. Northern Chinese culture is characterized by a great deal of drinking of any spirit that’s on hand, while southern culture is usually a little more genteel. The food in the north tends to be a bit more rich (and fatty)—all the better to insulate residents from the colder climes. So, even though we were driving just two hours north of the Yangtze River (and still in the same province), we were entering a whole different world of relationship building. The most raucous of the Yancheng government banquets was for lunch on Saturday. My colleagues and I, already veterans of the ‘baijiu’ wars, immediately demurred when our host suggested we drink the sorghum-based liquor during the meal (the stuff starts at 40 percent proof and tastes like shoe leather). Instead, we settled on red wine—from a Chinese vineyard—imagining that it would encourage a cordial and easy-going meal. However, we’d forgotten that Chinese like to chug red wine, filling goblets, saluting one another and downing the fluid in a single gulp. By the end of the meal, the eight government attendants were practically hugging one another, gushing homilies, and squeezing our shoulders and slapping our knees in what seemed genuine affection. So my American co-worker and I thought we’d shift our drinking tactics for dinner with a municipal government official later that same day, deciding to drink beer (which in China is generally a mere 1 percent to 2 percent proof). 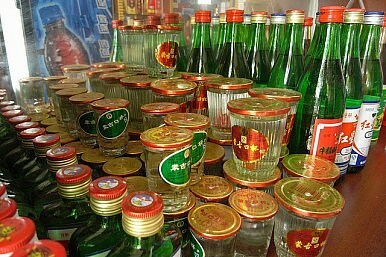 But again, officials insisted on the baijiu. We decided to demur though, playing the ‘weak foreigner’ card. More rich food and a couple of the government representatives were stumbling about, breathing on us. We’ll have to go through all this again in the same city at some point, as it’s an important region in terms of the nation’s energy policy. I’m going to try and see if I can just stick to green tea. Alibaba’s Jack Ma Sparks Debate Over China’s Long Working HoursWhat Are China’s Plans for its Airborne Corps?The Doolittle Raiders and Chinese Revisionist HistoryFoxconn CEO Terry Gou Says a Sea Goddess Has Told Him to Run for PresidentWill Xi Jinping Visit North Korea This Year?